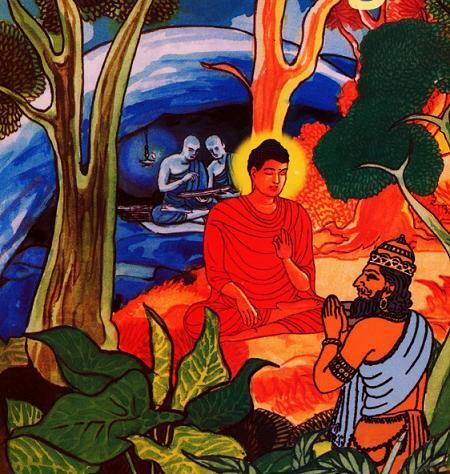 When the Buddha first started his spiritual quest for enlightenment, he learnt from two famous teachers at the time; first from Alara Kalama and then from Uddaka Ramaputta. Both teachers helped him to achieve high levels of meditative absorptions and bliss. However, when he came out of his meditations, he found that he still experienced suffering like everyone else. When he approach his teachers with this problem, they told him that they have taught him all that they knew and cannot help him to go further. 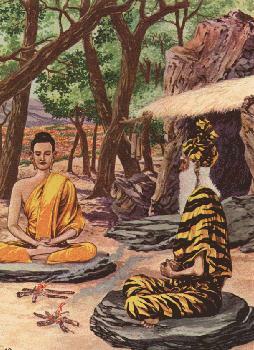 After learning from Uddaka Ramaputta, he realised that he must proceed on his own from then onwards. He needed to discover a path that can free him from suffering not just during periods of meditation but also when he is in the midst of worldly life. That was critical because without that knowledge, he will not be able to help others to find happiness in their life. All of us are asking this same question either directly or indirectly; how do we bridge the gap between our spiritual practices and are worldly life so that we can bring happiness into our life. This is a practical question that must be kept foremost in our mind. If not, it will be like embarking on a journey without knowing where the destination lies; we will not even know the general direction of where we are going! Many of my friends have asked me why they get more emotional when they meditate. Actually, the right word is ‘more aware’. They have not gotten more emotional but rather, are becoming more aware of them. I gave this metaphor: If we have been staying in a quiet place for a while and then suddenly move to a noisy place, we will find the noise unbearable. A person who has been staying in the noisy place for a long time will not even notice the noise. However, that does not mean that the second-mentioned person is better off. At least we have had the opportunity to allow our body to heal in the quiet environment. The second-mentioned person will continue to build up stress. Research has shown that people who lived near the airport with high noise pollution, continued to show high levels of stress hormones months after they shifting away from the noisy environment. We are all in the process of building the bridge between our spiritual life and worldly life. In that process, we may see that they are contradictory and separate. But once we have completed building the bridge, we will clearly see that our spiritual life is critical for us to live happily in this world (and I dare say, to gain material wealth, if that is what one is after). The common mistake we all make is to assume that we can only be happy once we achieve enlightenment or are reborn in heaven. This bridge is built with only two materials; awareness and understanding. Another word for understanding is wisdom. Awareness is the fuel for wisdom and vice versa. When we read spiritual books and listen to spiritual discourses, what we gain is intellectual understanding. 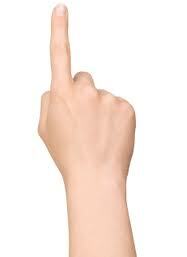 As the Buddha said, “The finger pointing to the moon is not the moon”. The wise person will look at the direction of where the finger is pointing to discover the moon. The unwise will cling on to the finger and continue to stare at the finger. Many years ago, I used to complain that although I can understand that I am not my body and mind, I could not see how this understanding can help me be happy. The reason for this dilemma is that at that point, I have yet to move from intellectual understanding to wisdom, which is experiential or true understanding. Our awareness is the connection between intellectual understanding and experiential understanding. Here is an example: The Masters encourage us to develop equanimity. It would be useless if we keep telling ourselves, “I must have more equanimity, I must have more equanimity”. In fact doing this can only bring us more suffering by arousing feelings of guilt. However, if we practice the techniques mentioned in my previous article, ‘Be Friends with your Emotions’, we can actually experience the peace that equanimity can bring; then the development of equanimity becomes natural and effortless. In a similar manner, by observing our body, feelings, mind and sense-objects, we can observe impermanence, the workings of karma, how everything is inter-dependent on each other, the illusory ego and all the other spiritual teachings taught by the enlightened Masters. All spiritual truths can be observed by merely observing our body, feelings, mind, and sense-objects. With awareness, we can look at the world with a fresh perspective and see for our self the truth contained in the scriptures. Once we see them with our own eyes, we no longer need to believe in what the scriptures say because we already know them to be true. If someone says that Mr. X is short, we will have to ‘believe’ it until the day we see Mr. X as short. After that, belief is no longer necessary. The Buddha replied, “We need to look at the nature of our love. Our love should bring peace and happiness to the ones we love. If our love is based on a selfish desire to possess others, we will not be able to bring them peace and happiness. On the contrary, our love will make them feel trapped. Such a love is no more than a prison. If the persons we love are unable to be happy because of our love, they will find a way to free themselves. They will not accept the prison of our love. Gradually the love between us will turn to anger and hatred”. “Majesty, did you hear of the tragedy that took place ten days ago in Savatthi because of selfish love? A mother felt she had been abandoned by her son when he fell in love and married. Rather than feeling as if she had gained a daughter, she only felt that she had lost her son, and she felt betrayed by him. Because of that, her love turned to hatred, and she put poison in the young couple’s food, killing them both”. “Majesty! According to the Way of Enlightenment, love cannot exist without understanding. Love is Understanding. If you cannot understand, you cannot love. Husbands and wives who do not understand each other cannot love each other. Brothers and sisters who do not understand each other cannot love each other. Parents and children who do not understand each other cannot love each other. If you want your loved ones to be happy, you must learn to understand their sufferings and their aspirations. When you understand, you will know how to relieve their sufferings and how to help them fulfil their aspirations. That is true love. If you only want your loved ones to follow your own ideas and you remain ignorant of their needs, it is not truly love. It is only a desire to possess another and attempt to fulfil your own needs, which cannot be fulfilled in that way”. An argument cannot last long if one of the parties is able to maintain his awareness. This is because he will be able to look past the other person’s words and truly understand the problem that is troubling the other party. During an argument, we often cannot express our issues clearly. A wife may complain about her husband’s long hours at work but what she failed to express is that she misses him and wants to have spend more time with him. If the husband is able to listen with awareness, he will feel compassion instead of anger. Without awareness and understanding, he may feel unappreciated for his effort to give his family a comfortable life. I previously wrote about conditions and conditioning. These are the two factors which determine our well-being. Conditions are the circumstances we face everyday. To live a happier life, we need to avoid those places and people who are not conducive to our peace of mind, for example, a person who is trying to give up smoking should avoid places where he will be tempted to smoke. We need to remove the causes of suffering and gather the causes of happiness. This is simple. When we benefit the society, we will plant the causes of happiness. When we harm others, we plant the causes of suffering. We do not need to believe in karma to see this truth. If we do something bad, we will always be worrying about being caught or revenge by those we have harmed. Also, I noticed that those who are dishonest are often very worried about being cheated themselves. They can never find peace of mind. Managing conditions is easier and managing our conditioning because we can control our conditions to a certain extent by using our intellect. Using our intellect is what we are used to. Managing our conditioning involves getting behind our intellect or mind because it is the basis of those conditioning. We need to use our power of awareness and observation to understand our conditioning and let go of them. I have already discussed this in my article on ‘Conditions and Conditioning’ and ‘Be Friends with your emotions’. A friend once said to me that to be happy, one must practice positive thinking. I replied, “I am afraid that I have to defer on that point. Can we really control our thoughts? Can we even tell our mind to remain quiet whenever we want it to? No, we cannot control our thoughts but we can be aware of them and our environment. With awareness, comes understanding and as our understanding grows, positive thinking arises naturally”. Positive thinking is useless if we are caught up in ignorance. “Of course, Gayasisa is much larger, Lord”. “It is like that, 0 Bhikkhus. For those who have arrived at Understanding thanks to their study and practice of the Dharma, their suffering is almost nothing compared with the suffering of those who are submerged in ignorance. Ignorance magnifies suffering by millions of times”. “Bhikkhus, suppose someone is struck by an arrow. He will feel pain. But if a second arrow strikes him at the very same spot, the pain will be much more than just doubled. And if a third arrow strikes him at that same spot again, the pain will be a thousand times more intense. Bhikkhus, ignorance is the second and the third arrow. It intensifies the pain”. “Thanks to understanding, a practitioner can prevent the pain in himself and others from being intensified. When an unpleasant feeling, physical or mental, arises in him, the wise man does not worry, complain, weep, pound his chest, pull his hair, torture his body and mind, or faint. He calmly observes his feeling and is aware that it is only a feeling. He knows that he is not the feeling, and he is not caught by the feeling. Therefore, the pain cannot bind him. When he has a painful physical feeling, he knows that there is a painful physical feeling. He does not lose his calmness, does not worry, does not fear, and does not complain. Thus the feeling remains a painful physical feeling, and it is not able to grow and ravage his whole being”. True love verses selfish love – do we realise the difference? The underpining notion is still the same…… love…. but how one looks and refers to it using the eye of ignorance leads to the perception of differences….